Guardians of the Galaxy Vol. 2 is actually, maybe not good. That is, anyway, the definite opinion of my colleagues and collaborators at this here website, and far be it from me to call them fools. Actually, it's kind of my opinion as well, sort of. Looking at the thing with an eye towards actually explaining what it is and what it does, I have to concede that a whole lot of what it does isn't really very impressive. In particular, director James Gunn's screenplay (he gets a solo credit this time around, after splitting writing duties, contentiously, with Nicole Perlman on 2014's Guardians of the Galaxy) feels enormously strained and labored, particularly where the comedy is concerned. And comedy, after all, is what this particular thread of the Marvel Cinematic Universe tapestry is all about. 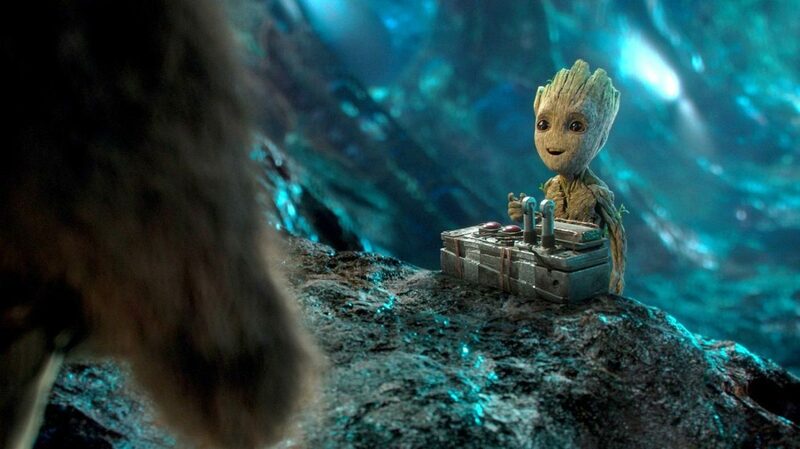 Obviously, all of the films are full of some kind or another of snippy quipping, as various screenwriters try out their best Joss Whedon impression; but the GotG films are actual comedies, and Gunn's pop culture-wise, absurdist comic voice is easily the most distinctive of any Marvel movie author to date. So it's a bit of a drag to have to see him work so hard for jokes that don't actually do much of anything. There's a line between "this reference to a bit of '80s pop ephemera facilitates the creation of a deeper joke" and "mentioning that Knight Rider was a TV show is by its very nature a funny thing to do", and I'd suppose it's a pretty clear-cut line, too. But many a screenwriter in the past few years has stomped all over it, and after largely staying on the side of the angels in 2014, Gunn makes a mess of it this time. Some of the gags in Vol. 2 are genuinely great, fleet and lively and snappy. Some of the gags are tired old things that only just manage to drag themselves, wheezing and heaving, up the the punchline. The other thing where the writing doesn't quite work is the story, stakes, themes, and character development. I apologise, that's more than one thing. But it's all kind of the same problem. Guardians of the Galaxy had one purpose as a storytelling object: combine five colorful weirdos in a small space, wind 'em up, let 'em go. For all that we can quibble and moan that its villain, Blue Person In Space, is among the most generic and forgettable bad guy out of all the generic and forgettable bad guys who've antagonised the MCU heroes, it's largely forgivable on the grounds that the plot doesn't really matter. The first Guardians is naught but a summertime hang-out movie, granting almost all of its pleasure from the spectacle of seeing five well-etched archetypes try to outsass each other, all to the tune of the best AM hits of the late 1970s. Vol. 2 captures a lot of the same vibe - and with an even better soundtrack than the last one, used to better effect - but there's too much clutter, and it's clutter we've seen before. Now Peter "Star-Lord" Quill (Chris Pratt), half-human ex-thief turned galaxy-saving hero, has a huge basket of daddy issues to contend with - oh, to be able to outlaw even for just one year daddy issues from the acceptable list of screenwriter's shortcuts! - and so, rather weirdly, does the psychopathic cyborg Nebula (Karen Gillan), a minor villain from the last movie who mostly remains a villain this time in a much-expanded role, but is obliged to hang-out with the heroes in order to get to do her villainy. Peter's daddy is the mysterious space wanderer Ego (Kurt Russell, ideally cast, but not very energetic), who saves the guardians of the galaxy from their latest misadventure, getting shot at by a race of gold-plated Übermenschen led by an angry and arrogant high priestess (Elizabeth Debicki, giving easily my favorite performance in the movie). Where things go from there are complicated without really needing to be; the arc of the thing involves Peter having to decide who his real family is, while the other four rag-tag vagabonds he pals around with - humorless woman warrior Gamora (Zoe Saldana), violence-prone mutant raccoon Rocket (voiced by Bradley Cooper, played on-set by Sean Gunn, the director's brother), the compulsively literal Drax (David Bautista), and tree-alien sapling Groot (voiced - barely - by Vin Diesel) - harbor grave misgivings about Ego and also fend off the various large space armadas trying to kill them all. Somehow, this takes 136 minutes, though it only really sags in the end, the latest in the interminable line of noisy, impersonal climaxes of every recent comic book movie that's not about Hugh Jackman slowly dying. All that being said - and my, it wasn't very nice of me, was it? - I actually somewhat loved the experience of watching Vol. 2; it's potentially my second-favorite MCU film after the first Guardians, and easily the one that most benefits from the big screen and pumped-up surround and all. It's quite a delicious audio-visual experience, right from the word "go" - the opening credits have finally dethroned "Star-Spangled Man" from Captain America: The First Avenger as my favorite individual sequence from any of these movies, using a long, circular single to deliberately subordinate the nominal action of the sequence in favor of sheer, ditsy pleasure. And the rest of it, if not quite up the joyful popcorn movie frivolity of that moment, nevertheless reaches quite a high bar in terms of grandiose design in eye-searing bright colors, with pulp sci-fi touchstones brought in by the barrel-full. What this is, really, is finally the first comic book movie to show us the cinematic version of Jack Kirby - and yes, I am well aware that Kirby wasn't involved with the Guardians of the Galaxy titles in any of their incarnations. That's besides the point. What we have here, and I am constantly giddy to have it, is a movie version of the over-the-top fantasy worlds of Kirby's late, weird stuff, when he and Stan Lee had parted ways. Mostly this is just a matter of production design, courtesy of Scott Chambliss, but there are a good number of individual shots where Gunn and cinematographer Henry Braham just slide right in there with some dramatically overwrought comic book panel brought to life (a gorgeously florid sunset on Ego's home planet leaps to mind). The film's effects aren't necessarily all that great - it's a step down from Doctor Strange, for sure, and even a step down from the first Guardians - but the aura of cartoonish whimsy that dominates the film's visuals largely excuses whatever little limitations of photorealism are to be found through the film's very CGI-ey CGI. There are other, smaller joys to be had. While the cast is mostly less energetic than before - Saldana most notably - Bautista is, if anything, even bigger and goofier and hammier than he was last time, to outstanding effect, particularly in his caustic, loopy, and ultimately sweet scenes with the new character Mantis (Pom Klementieff). And Cooper at least hasn't deflated much in his sarcastic, nasty-minded treatment of Rocket, though he'd have been better-served by a screenplay that didn't so enthusiastically provide the misanthropic raccoon with weepy soul-searching. The music, I've mentioned, is pretty fantastic - not always well-used (the first appearance of Fleetwood Mac's "The Chain" mostly only serves to lessen the impact of the second appearance, and George Harrison's "My Sweet Lord" is used in the most cloying, clichéd way this movie could have ever managed), but there are moments of pure inspiration, most notably the action scenes set to ELO's "Mr. Blue Sky" and Jay and the Americans' "Come a Little Bit Closer", and even the extremely trite use of Cat Stevens's "Father and Son" feels surprisingly well-earned by the time it arrives (and buoyed by some very lovely imagery accompanying it). None of this is to say that the film tells a compelling story well. It tells a tepid story drawing heavily from the laziest tropes of modern popcorn cinema well. And that is a frustration, no doubt. But summer movies... sometimes, a movie that looks beautiful and cool on the biggest screen you can arrange, and which sounds like a million bucks, sometimes that's all you need for a summer. And though I'll be distraught if summer 2017 can't top this, at least a couple times over, this is much closer to the best of contemporary comic book movies than the worst, or even the most average.